Browse for horns by vehicle make and model. 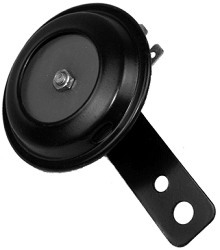 Black enameled steel body with electroplated steel mounting hardware. Adjustable horn tone. 1/4" wide tab connectors. Designed for electric scooters and electric bicycles. Rear facing mounting post. 12V DC. Black enameled steel body and hardware. 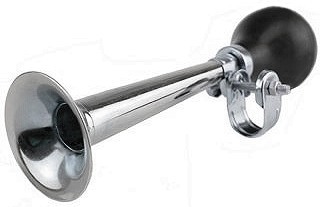 Adjustable horn tone. 1/4" wide tab connectors. Designed for electric scooters and electric bicycles. 12V DC. Black enameled steel body and hardware. Adjustable horn tone. 1/4" wide tab connectors. Designed for electric scooters and electric bicycles. 24V DC. Black enameled steel body and hardware. Adjustable horn tone. 1/4" wide tab connectors. Designed for electric scooters and electric bicycles. 36V DC. Black enameled steel body and hardware. Adjustable horn tone. 1/4" wide tab connectors. Designed for electric scooters and electric bicycles. 48V DC. Straight trumpet style bulb horn for electric scooters and bikes. 9" long. Chrome plated steel body with thick rubber squeeze bulb. Includes handlebar mounting hardware. These squeeze bulb air horns are loud and the sound carries for a long distance. Great for warning the people ahead of you that you are approaching. 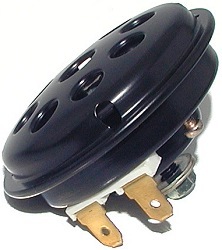 Straight trumpet style bulb horn with cover for electric scooters and bikes. 5" long. 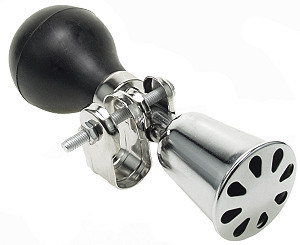 Chrome plated steel body with thick rubber squeeze bulb. Includes handlebar mounting hardware. These squeeze bulb air horns are loud and the sound carries for a long distance. Great for warning the people ahead of you that you are approaching. 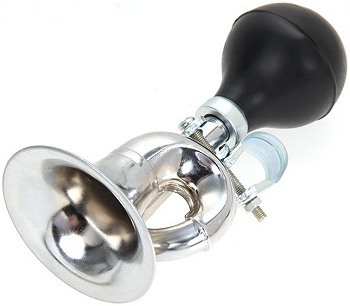 Bugle style bulb horn for electric scooters and bikes. 7" long. Chrome plated steel body with thick rubber squeeze bulb. Includes handlebar mounting hardware. These squeeze bulb air horns are loud and the sound carries for a long distance. Great for warning the people ahead of you that you are approaching.